It has been quite some time since I visited my team in Noida. So I decided to visit them in the last week of July and informed them that I am coming there for a week. Since I am visiting them after over a year, we all decided that we make full use of the trip and decided to go on a tour the following weekend. After exploring all the options, the team decided on Jaipur – The Pink City. After completing our work on 31st July, we started on the early morning of Aug 1st (as early as 1:30am). Shalabh had managed to hire a Tempo Traveler for a very good deal, while Himanshu managed the entire trip very well. 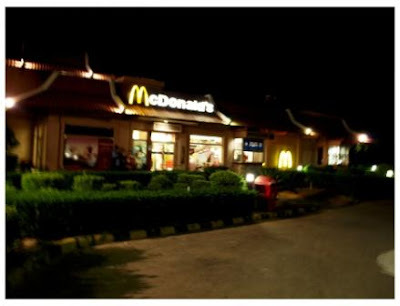 We stopped at McDonalds, Manesar, around 3:30 am and packed some burgers and sandwiches to keep our stomachs from growling. Most of us had dinner quite early in the evening and some of them did not have dinner at all. None of us had the idea of sleeping and all were on our own talking with each other. Surbhi tried her best to get everyone involved in Antakshari, but few of the more notorious fellows (including me) were interested in ghost stories. The talking, chatting and fun continued on till we reached Rajasthan border. We had to stop there to pay the inter-state permit charges. We utilized this time to have some refreshments, as it will be taking about 15 minutes. We had some tea in the roadside tea shop and then continued our journey further. We traveled for about 2 hours, when we decided to halt for a while for the driver to get some refreshments. He was feeling very tired and sleepy. I utilized this time by shooting some birds that I found there. After a halt of about 10 minutes, we proceeded on our journey and reached Hotel Shika in Jaipur at around 09:30 hours. It was decided that we will freshen up, have breakfast and start for sightseeing ASAP. It was already 10:30 before we settled in and relaxed. So did not have much time to start. I should take a moment (or may be a paragraph?) to mention something about this hotel. It is relatively new, about 2 years old. Right opposite to the hotel was the Deer Park, which has a herd of spotted deers. There were lots of birds around that area as the park looked big from the hotel and also seemed to have lots of trees. So it was obvious that there will be birds. Occasionally I also heard the scream of a peacock or peahen. This means there is enough to motivate me to get ahead of others. I freshened up and got ready in about 15 minutes, finished off my breakfast and started off to the park. Taran and Nikhil also had finished their breakfast and started with me. We went across the road to the park and entered in. We realized that the area where the deers were freely roaming around was locked and fenced, but can get a very good view from within the park or from the adjoining road. Within 15 to 20 minutes we were called back by Shalabh and Himanshu as everyone were ready and we had to leave, if we had to cover some places. It was about 11:15 when we started from the hotel. Our first destination was Amber Fort, built by M aan Singh, the Commander-in-Chief of Akbar. 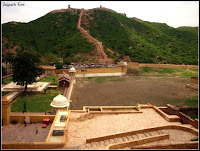 It was a 500 years old fort adjoined by Jaigarh Fort. The Amber Fort was so huge that the moment I saw it, I became doubtful whether we will be able to explore the entire place in the 2 hours time that we planned. We explored as much as possible. We did not have a proper guide to show us around and describe the various places within the fort. So we just went through the place and were admiring the Moghul arts and architecture of those times. Around 2:00 we realized that it is getting late and had to leave if we have to visit other places. 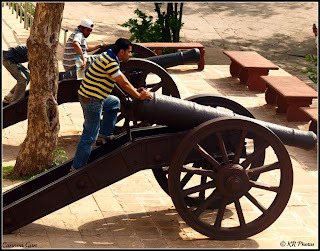 Since it was already past noon, we thought of skipping Jaigarh Fort (bad decision I guess) and head to Nahargarh Fort. By the time we reached there, it was around 4:00pm and everyone were famished. We saw a board for Cafeteria while reaching the Nahargarh Fort and decided that we first have lunch and then proceed to sightseeing. To our disappointment we found that the lunch time is over. There was another restaurant nearby but that too was closed since it was too late. The only option we had was a lime juice. Due to the heat and hunger we just thought of having whatever is available. For the unwary travelers – please make sure you have enough stock of water and food if you want flexibility in timing, or plan in such a way that you reach the right places at the right time. We really did not have enough time to explore the place since it was already 4:30pm. We decided to move back to Jaipur to have lunch as there is no place where we can have lunch there. We went back and on the way caught a glimpse of the beautiful Jal Mahal. Stopped for a while to click some photographs and headed back to Jaipur. We had food in a restaurant (a very late lunch) and proceeded to the old city. We stopped in front of the Hawa Mahal only to realize that it has just been closed for the day. So we decided to stroll in the bazaar. The place is famous for handicrafts and textiles. You can get colourful and good Rajasthani materials, but you will have to be very cautious about the prices. One thing that caught our eyes was a man calling out people to take photographs from his camera. He had his camera in the roadside platform. He did not have any studios. We were reluctant initially but when we realized that it is a 150 year old camera with a Carl Zeiss lens, we could not resist. The developing and printing was done then and there in the open platform and the photos are ready in about 10 minutes. All that he charges for this is Rs.20. A few people decided to take photos with that camera and I decided to take a snap of the oldest camera known to be working (at least for me). 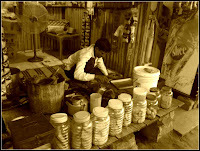 We then shopped for over an hour and decided to go to the much awaited Chowki Dhaan. Chowki Dhaan is a resort. Not the luxurious one on the sea shores that most of us are used to. But this is more of a village than a resort which shows the visitors how the traditional Rajasthan will look like. No glaring lights, no jarring music, no techie gadgets and giant roller coasters that will make it look like a theme park. It is just the traditional village. 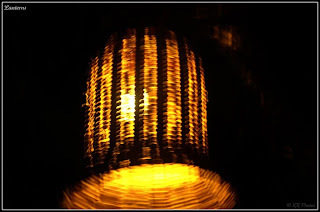 The light sources are from 40 or 60 watts bulbs that is surrounded by thatched baskets acting as lamp shades. With that we returned back to our hotel in the heart of Jaipur city. Most of us were unable to sleep and decided to hunt the coffee day in the ground floor of the hotel. Though there weren’t anyone the shopkeepers let us in and spend a while there. 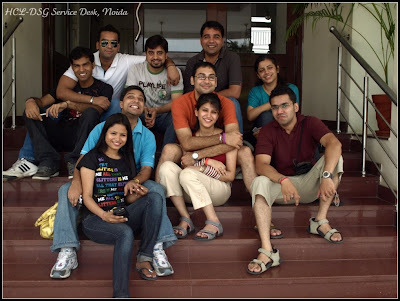 The next day being Friendship Day, we decided to wait till mid night to wish each other. At midnight the Coffee Day guys offered us a big chocolate cake. Nothing more was needed to celebrate the Friendship Day. We spent some time chatting and making fun of each other and around 1:00am we decided to retire. The plan for next day was to start by around 10:00am from the hotel and head straight to Delhi. As usual I got up and got ready before everyone. I had packed my bag the previous day itself, so did not have to worry about packing. Once ready I again set off to the deer park opposite to the hotel. This time I had lots of time to explore the park. 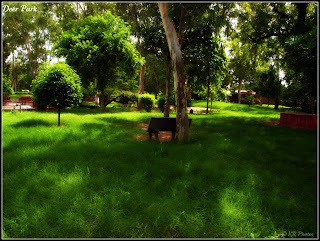 It was really a beautiful place, well maintained with lots of trees and plants. The park, apart from deer, houses lots of birds. I even spotted a peahen somewhere in between the shrubs, but was not lucky enough to get even a single decent photograph of the shy bird. It is a huge park and I was just wandering there over half an hour and took a few photographs. After about 40 or 45 minutes I returned back to the hotel to join everyone for the breakfast and started our journey back to the capital. We stopped just twice on the way, once for fixing a flat tyre and once for having lunch in Haryana border. Though we did not get to visit all the places we intended to, it was a very useful tour for all of us. Though we had interactions everyday over the phone, it was really good to meet everyone personally after over a year. The major agenda of meeting the people after a longtime was served successfully and there could not have been a better way to accomplish this. Hats off the Himanshu who has been organizing the entire tour and for making sure that everything went as per the liking of everyone. As far as the tour to Jaipur is concerned, I did not expect there would be so much to see there. Hope I will get one more chance to visit the beautiful place, but it will certainly be more planned and for a longer duration.